“NURSES WITH OUR EXPEDITIONARY FORCE REINFORCEMENTS.” Punch (Melbourne, Vic. : 1900 – 1918; 1925) 2 December 1915:<http://nla.gov.au/nla.news-article138703218&gt;. Born in Maryborough in 1889, Josephine Kennedy was a daughter of James Power Kennedy and Carol Louisa Croxford. 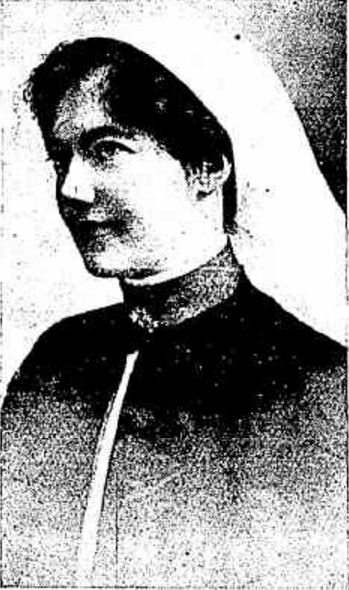 She began training as a nurse at Hamilton Hospital in 1911 and passed her final examination for the Royal Victorian Trained Nurses Association in December 1914. During her time at Hamilton Josephine also completed a certificate in infectious disease. With her training completed, Josephine left for Fairfield Hospital. On 7 October 1915, Josephine enlisted and soon after the Defence Department notified her to prepare to leave at the end of the month for Egypt. It was a little longer than that with departure coming on 12 November 1915. Josephine’s father received a cable on 12 December 1915, letting him know she had arrived safely at Heliopolis. 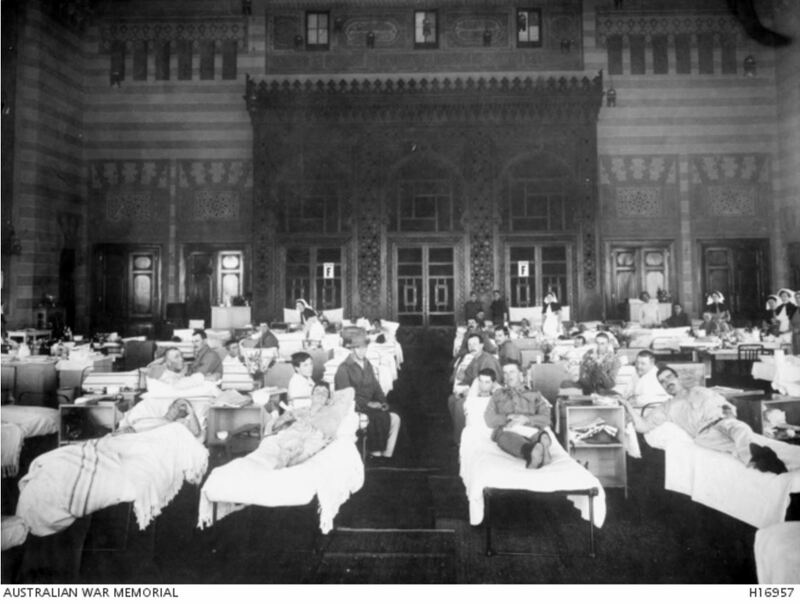 On 9 January 1916, Josephine wrote home to her father to tell him she was at an English hospital staffed by Australian nurses at Shubra, Egypt, about twenty minutes by train from Cairo. 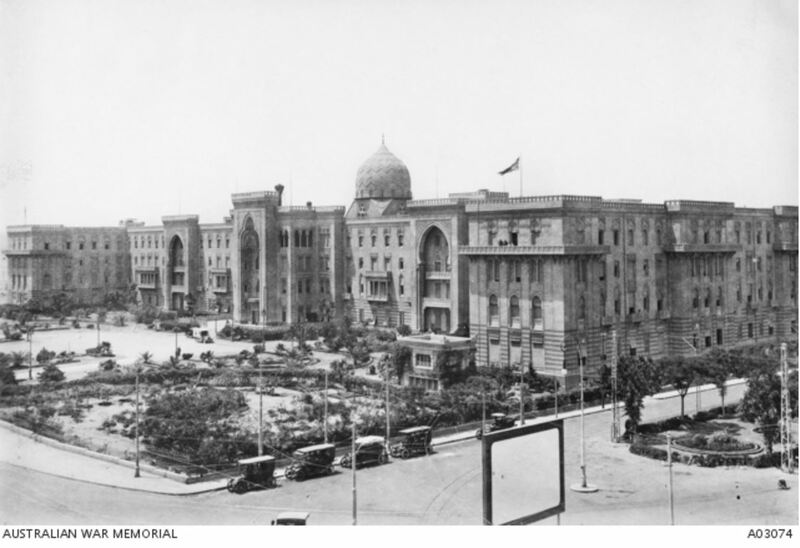 By 15 February, Josephine had moved on to the No.1 Australian General Hospital at Heliopolis (below). On 4 March 1916, Josephine was admitted to the 2nd Australian General Hospital with a mild illness. Two weeks later, she wrote to her father from the Empire Nurses’ Red Cross Club by the sea in the Saba Basha district of Alexandria. She was convalescing after her hospitalisation but thought she might get to see France soon as some of the other girls were going. She didn’t go to France instead she returned to Cairo on 23 March 1916. While in Cairo, Josephine collected local curios and sent them home. In July 1916, Mr P.T.Vizard placed a display of her collection in his shop window in High Street, Maryborough, including metalwork and enamel items. Amongst the collection was a scarab bracelet. During her time in Egypt also nursed at an English Infectious Disease Hospital at Shoubra near Cairo. But after fifteen months, her service in Egypt ended and Josephine left for England on 16 January 1917. She went on to France on 8 February where she was posted to the No. 13 General Hospital at Boulogne. She contacted her father to let him know she was safe but the news could travel slowly. Soon after he received her letter, a cable arrived on 20 March 1917. It advised Josephine was admitted to the No. 14 General Hospital at Boulogne on 15 February suffering severe illness, the nature of which was not known. Josephine’s records show she was in hospital with a septic finger during that time. In March 1918, Josephine was posted to the 24th Casualty Clearing Station in Italy. She also nursed at the 13th Stationary Hospital at Geona, Italy and a hospital at Istrana, Italy. On 1 October 1918, she was promoted to Sister. Although the war was over, Josephine remained in Europe until 26 January 1919 when she returned to England to join the 3rd Australian General Hospital at Dartford. Just over a month later Josephine was homeward bound. On her return, Josephine continued nursing and lived in Green Street, Windsor. She later moved to Parkville where she worked as a welfare nurse before marrying in 1927 to Charles McIntosh. Josephine died in 1976 aged eighty-seven and was buried at the Cheltenham Memorial Cemetery. Josephine Kennedy’s name is on the Hamilton Hospital WW1 Honour Board.